There are plenty of Trappers out in the open world of Red Dead Redemption 2, and this guide will help you track them all down. Trappers are special animal merchants in Red Dead Redemption 2, that deal in crafting unique outfits for Arthur Morgan. In our Red Dead Redemption 2 Trappers guide, we'll be walking you through everything there is to know about unlocking Trappers in the huge game, as well as providing you with a list of various Trapper locations in Red Dead Redemption 2, so you can find one no matter where you are. If you instead need any additional information at all on Rockstar’s wild west prequel, you’ll want to head over to our Red Dead Redemption 2 guides hub. Here you can find our ten essential tips to surviving the frontier, as well as complete index of our additional guides. You're going to want to head to a Trapper in Red Dead Redemption 2 quite a lot, so it's handy to know where you can find one. In this Trapper locations guide we've got the details on the five locations you can find a trapper in Red Dead Redemption 2. Consult the list below for all your Trapper needs. 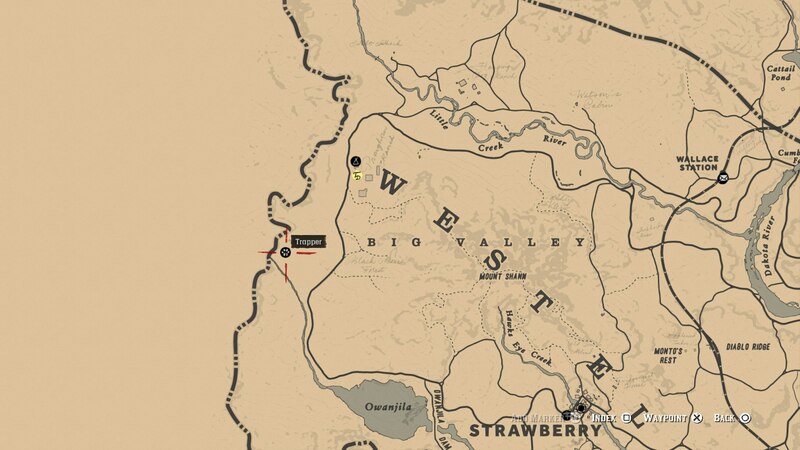 The main Trapper in Red Dead Redemption 2 can be found on the map point just below, in Saint Denis. As we mentioned previously, the Trapper is an animal specialist, and you can bring him your animal pelts and other items, which he can then use to craft you brand new gear. But there's not just one Trapper found in Red Dead Redemption 2. 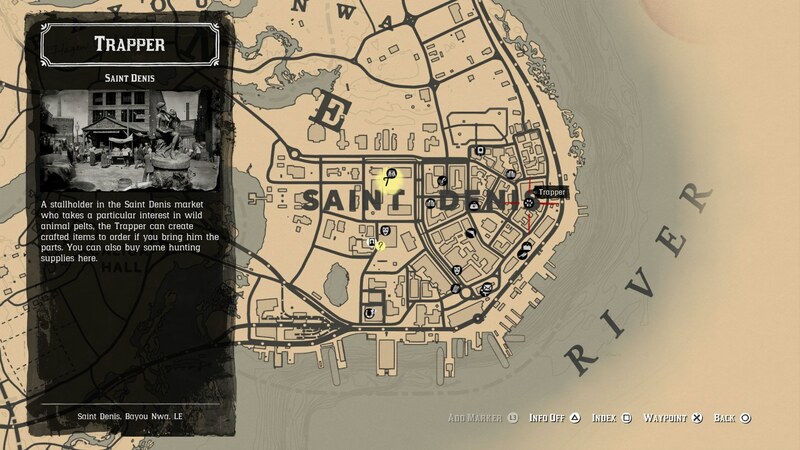 He operates a total of five stores, and while you can find the home base in Saint Denis, there's another Trapper at the location just below. 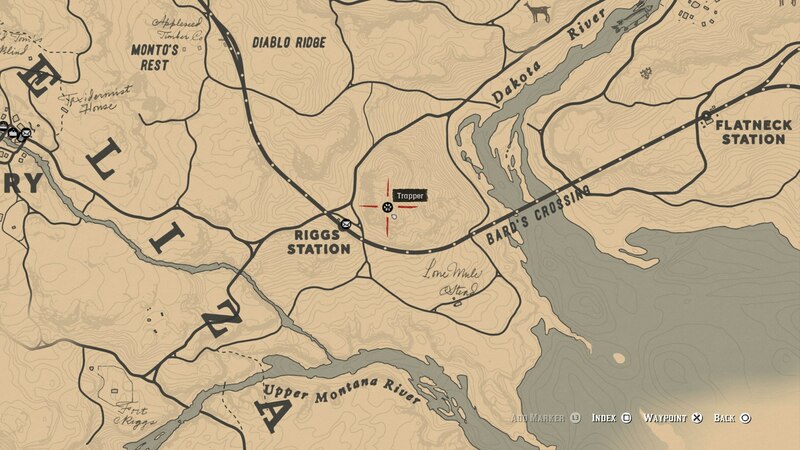 As for the third location of the Trapper, there's a small store located just west of Rigg's Station, on the map point marked just below. We should mention that all five Trappers sell exactly the same gear, so there's no benefit in going to one over the other. Fourth, you can find another Trapper operating in the western reaches of West Elizabeth. This Trapper can be located northwest from Strawberry, or southwest from Pronghorn Ranch. Finally, we've tracked down another Trapper that operates southwest from Blackwater. 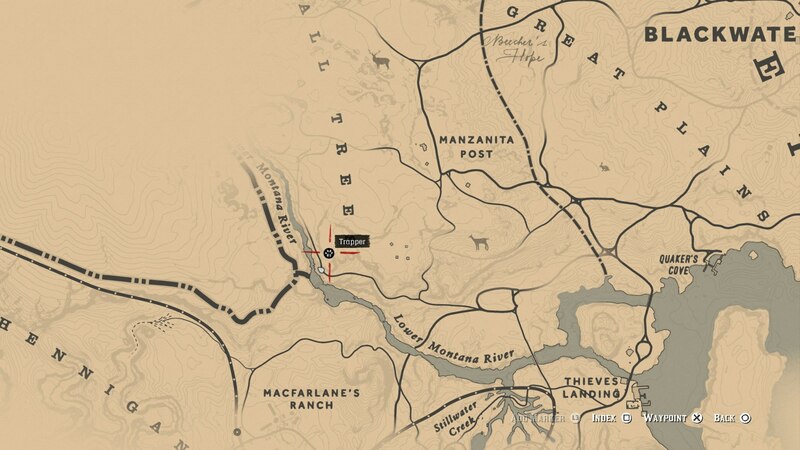 Keep in mind that you'll be wanted, dead or alive in this region for quite a while at the start of the game due to the failed Blackwater bank robbery, so best leave this one till later. 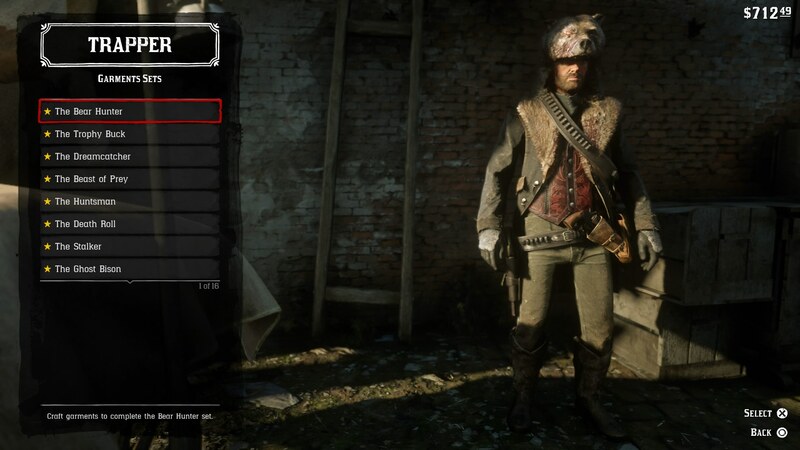 In the list below are all the unique outfits that the Trapper located in Saint Denis offers. There’s four gear pieces per outfit, and you’re going to have to collect a fair amount of animal materials in order to craft each outfit. 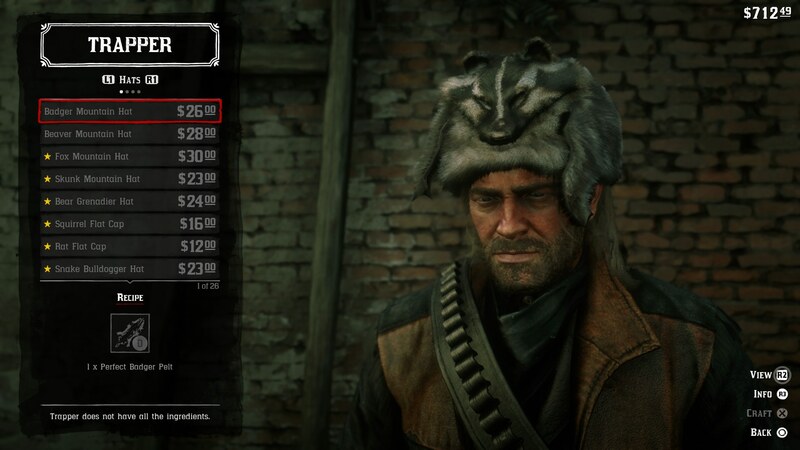 The Trapper also sells a total of 26 hats, 7 saddles for your horse, and many more items. They’re not hard to find, but you’re definitely going to want to keep your animal pelts on you and avoid donating them to the camp, if you want to unlock all this Trapper has to offer. Basically speaking, the Trapper is a merchant in Red Dead Redemption 2 that deals exclusively in animal equipment. As you can probably tell from the guide above, this means equipment made out of animal items, like hides and pelts, as well as equipment for your horse. 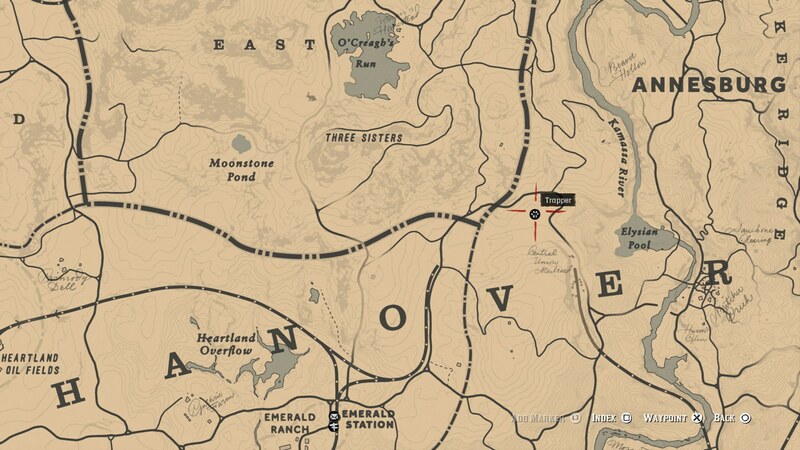 If you're ever in need of some items with which to track down animals, head to the Trapper, rather than Pearson back at camp. Now that we're all done with this Red Dead Redemption 2 Trapper guide, you can check out our other guides on the game. You can head over to our Red Dead Redemption 2 Hunting guide, or our Red Dead Redemption 2 Cheats guide for more.